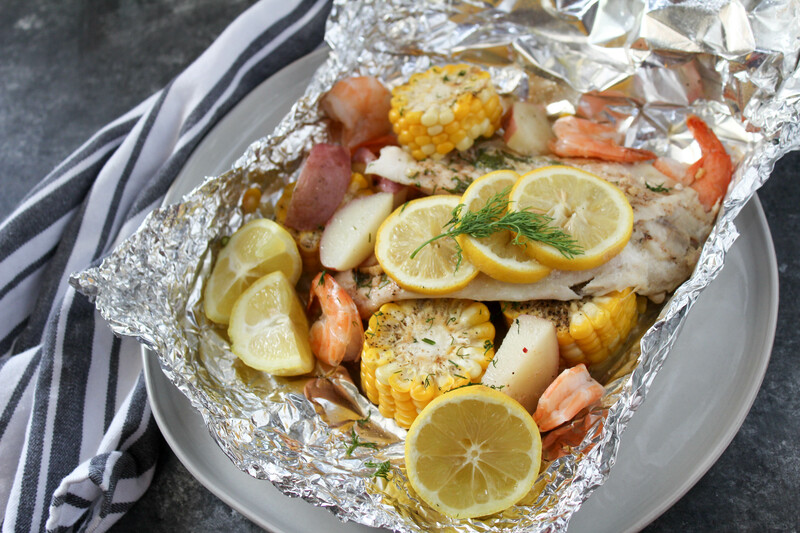 Foil Wrap Fish Bake is a simple dish that packs a lot of flavor. Only one of many recipes in Real Life Dinners by Rachel Hollis. Lately I’ve been obsessed with cookbooks. Ok, with all books, but cookbooks too. 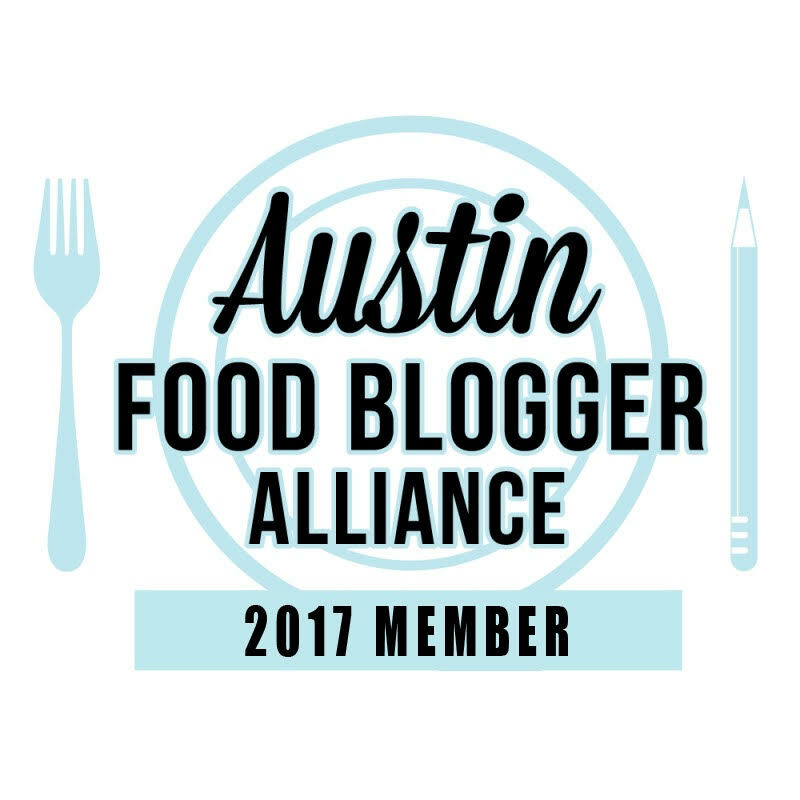 One of my favorite people to follow on social media is Rachel Hollis and she recently came out with her second cookbook, Real Life Dinners! 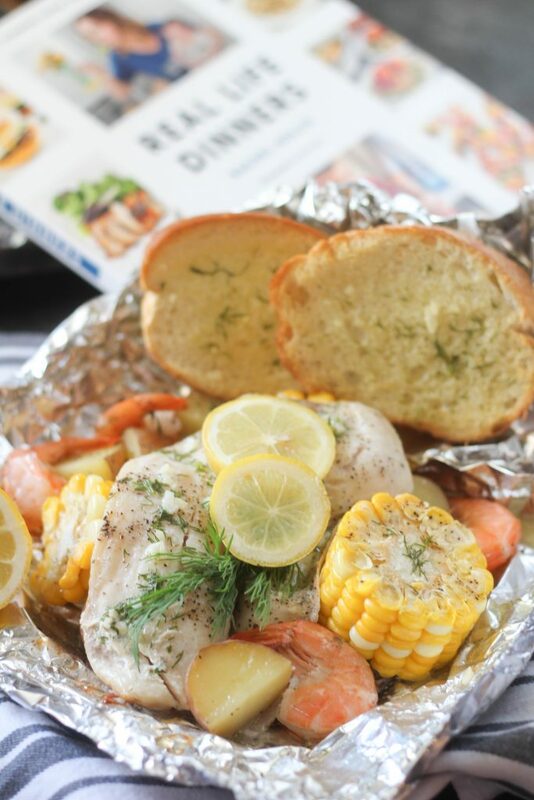 Below I’m sharing her recipe for a Foil Wrap Fish Bake. Rachel just seems like she would be the exact same way in person as she is online. While she was going through the adoption process, I was so invested in the outcome for her and her family. Getting my hands on her cookbook, was wonderful because we cook a lot of the same types of foods. I have made a couple of things from the cookbook and will be definitely be cooking more from there. Especially after taking a little break from this here blog this summer, I want to simplify things and part of that is making easy, wholesome meals. The entire cookbook is filled with easy meals that you probably already have the ingredients in your pantry, refrigerator or freezer. We’re all so busy these days and this cookbook will help you get dinner on the table quickly for you and your family to enjoy around the table. Not only did Rachel have her cookbook come out recently, she also released Girl, Wash Your Face. I read (ok, listened) this book a couple of months ago and I have probably recommended it to everyone I know. It is going in Christmas gifts this year. The book just resonated so much with me and I had so many aha moments that I would pull over to make a note in my phone so I wouldn’t forget any of her tidbits. Do yourself a solid and go get this book. Try a sample on Audible then order that thing! I promise you will love it! So I decided to make her Foil Wrap Fish Packet because I love me a foil wrap meal. An entire meal in one packet with hardly any cleanup? Yes, please. But, we all know I can’t turn on a grill for fear of blowing myself up so I adapted Rachel’s recipe to cook it in the oven. And don’t even think about leaving out the bread. You will want it to sop up all that buttery goodness. 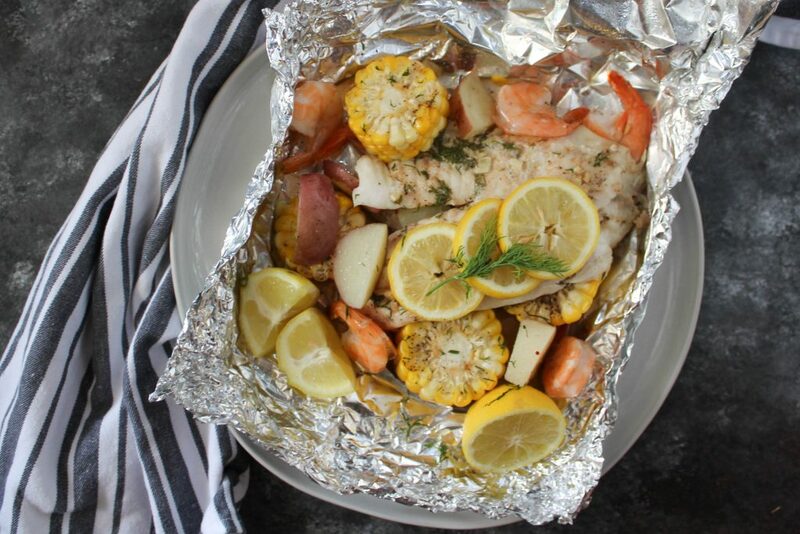 Foil Wrap Fish Packet is a simple dish that packs a lot of flavor. Only one of many great recipes in Real Life Dinners by Rachel Hollis. Cut four pieces of foil to 18 inches long each. In the front half of each of the four foil sheets, place one quarter of the potatoes and evenly divide the corn on the cob pieces. Place a slice of fish on top of the potatoes. Add four shrimp around the fish. Stir together the melted butter, garlic, dill and one teaspoon black pepper and one half teaspoon salt. Pour evenly over the fish fillets. Top with a couple of slices of lemon. 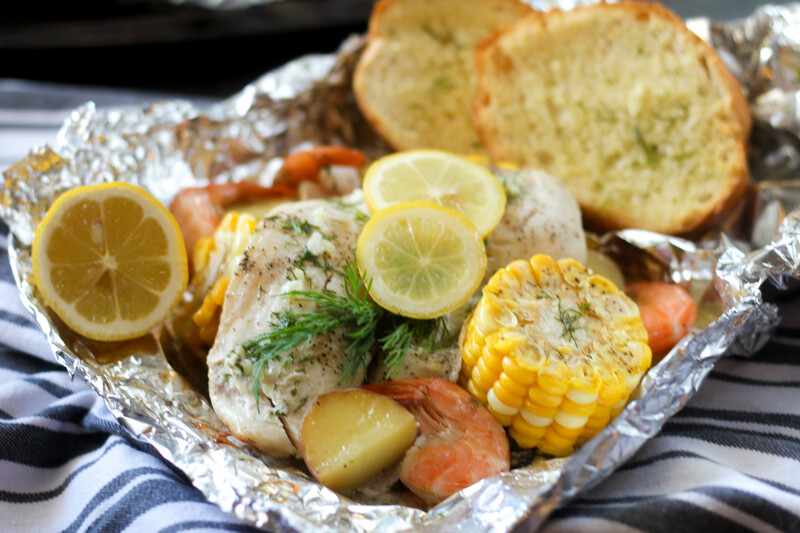 Carefully fold the long end of foil over the top of the fish and vegetables. Double fold to seal the three edges on each of the foil packets. Place the packets on a baking sheet and place in the oven for 20-25 minutes, until fish and potatoes are done. Serve immediately with crusty bread and lemon wedges.